The website and domain name selfpackaging.com belong to LADYSYSTEMS INTERNATIONAL LTD, with VAT No. GB 653 9944 89. The company is domiciled at Unit 1, Camboro House, Camboro Business Park, Oakington Road, Girton, Cambridge, CB3 0QH, U.K., and is Registered in England and Wales under Company No. 6025852. If you have any questions about these Terms, please contact us at customer.care@ladysystem.co.uk. The contents of this site, including the text, images and designs, belong either to LADYSYSTEMS INTERNATIONAL LTD, or to third parties which have authorised their use. LADYSYSTEMS INTERNATIONAL LTD presents this content for advertising purposes, and to provide information about its activities, and authorises its use purely for this end. In general, its use for commercial purposes, and any transformation or alteration are prohibited. The use of these designs, images or texts must explicitly state their ownership by LADYSYSTEMS INTERNATIONAL LTD, which reserves the right to initiate any legal action it deems appropriate to seek redress for any damage or prejudice caused by any act that violates its intellectual or industrial property rights. The presentation of the contents of this site within another window belonging to someone other than LADYSYSTEMS INTERNATIONAL LTD (framing) is not authorised. Any personal data obtained by means of contact forms or otherwise on this website and through the receipt of emails is treated in confidence and in strict accordance with The General Data Protection Regulation (EU) 2016/679 (GDPR). It will be used only to respond to requests for information or consultations, and will not be used for sending unsolicited information or communications to any other person or party. Such data will be maintained in strict confidence in a secured file in the event of a continuing dialogue or relationship between LADYSYSTEMS INTERNATIONAL LTD and the interested party, which will take place solely with the express consent of that party. The data obtained in this manner will be used by LADYSYSTEMS INTERNATIONAL LTD in order solely to administer its normal day to day relations with customers and suppliers and will not be passed on to or sold to any third party. Users of this website can access this data and rectify it, oppose it, or cancel it at any time. 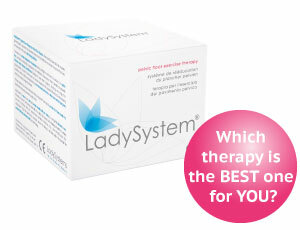 To do so please contact us at customer.service@ladysystem.co.uk. Although LADYSYSTEMS INTERNATIONAL LTD acts with the utmost possible diligence, we take no responsibility for ensuring that any content or item of information included is entirely up to date at the time a user of the website consults it. LADYSYSTEMS INTERNATIONAL LTD reserves the right to unilaterally modify, at any moment and without prior warning, the presentation, configuration and content of this website. LADYSYSTEMS INTERNATIONAL LTD is not responsible for any information that may be obtained from external links included on this site. Any personal identifying data appearing on this website and especially in the CUSTOMER REVIEWS section appears only with the express prior consent of the author of that comment or review as long as it has not appeared previously in the public domain. Any similarity of the author’s identity to that of any third party is accidental and purely coincidental. Should any person or party believe the latter has occurred please contact us at customer.service@ladysystem.co.uk to request deletion or modification. The use of this website implies full acceptance of the terms and conditions of this present legal notice. Any possible conflict arising from this website will be regulated exclusively by the laws of England and Wales and the jurisdiction only of the courts and tribunals of that territory. All persons using this site, regardless of the jurisdiction of the territory from which access is gained, agree to accept these clauses and expressly renounce recourse to any other jurisdiction to which they may be subject.